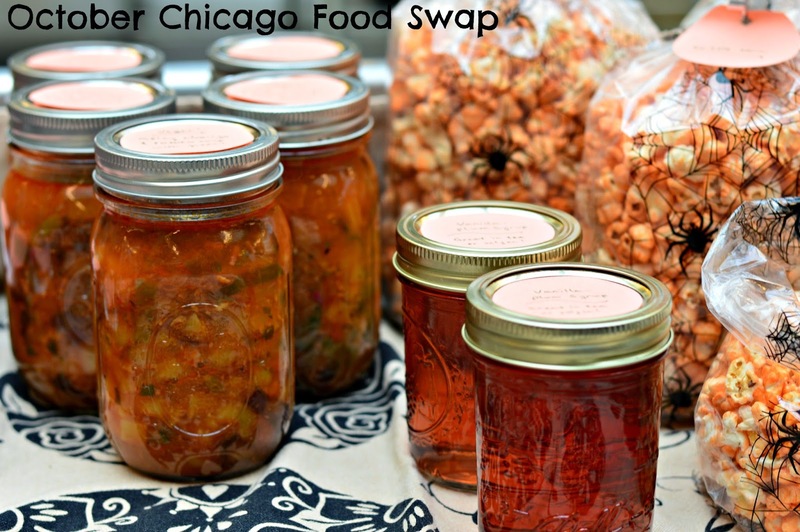 The Chicago Food Swap had its October event on October 19. It was our second event in our new home, the Peterson Garden Project’s Fearless Food Kitchen. As is so often the case, the offerings reflected the best of the season, from the tail end of backyard garden produce to Halloween-themed treats. The October swap was smaller than the September swap had been, but no one minded. Smaller swaps have their charms, most notably a greater opportunity for attendees to converse amid all the browsing, sampling and swapping. This intimate, twenty-five person swap was populated mostly by returning swappers with a handful of newcomers, who were welcomed warmly. One veteran swapper, Chris, even brought his mom who was visiting from out of town and although she had never heard of a food swap before, Mom was very enthusiastic. As always, the savory offerings were in high demand. I think every attendee wanted to go home with some of Leigh’s potato and onion pierogi. Soups were also a popular item from Liz’s butternut squash soup to various forms of chili. Lindsay ran out of her carrot top pesto in minutes. I was so anxious to get some that I traded for her sample jar! Cathy brought potstickers that flew off her table. Unfortunately for me, they contained pork so I could not bring them home. Chris’s red lentil dal mix, which promises a healthy vegetarian dinner in twenty minutes, was also a hit. Keli and Gary’s bleu cheese and chive biscuits tasted as good as they sounded and made a great addition to my family’s dinner last night. Although it is certainly the end of backyard garden produce season, a few people brought homegrown kale and there were plenty of fragrant herbs on offer as well. Swapper Gena not only brought fresh kale but also kale salad — I gather the kale rather took over her garden this year. Many swappers brought pickles and relishes made with summer vegetables and some got very fancy decorating their jars. New swapper Liat, who teaches canning classes at the Fearless Food Kitchen, brought a wide variety of pickled vegetables to trade. The sweets were pretty amazing this time around. New swapper Diane had everyone hoping that she would become a regular with her amazing oatmeal lace cookies, made from her grandmother’s recipe, and peanut butter treats made with Honeycomb cereal. There were several kinds of caramels on offer and I think I came home with a bag of each. Vegan swappers Ian and Alison made some soft chocolate candies that tasted exactly like a gourmet Tootsie Roll. There were fig bars, strawberry rhubarb bars, pecan blondies, and vanilla plum bread from veteran swapper Chris. I even brought some very fancy raspberry mousse cake from a recipe I had been testing. Judging by the response, I think the recipe is a keeper. In the category of fall cooking, I saw apple butter and apple pie filling, gingersnaps, and spooky popcorn eyeballs for Halloween. 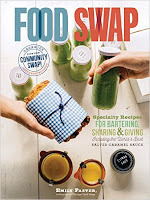 If this swap is any indication, the November swap will be chock full of fall-themed foods! Speaking of the November swap, it will be held on November 16 and it will be the final swap of the year. (Yes, given the craziness of the holiday season, there will not be a swap in December.) So, if you want to swap again in 2014, the November swap will be your last chance. I have every reason to believe that it will be a large and lively gathering, so won’t you join us? Register for the November swap today! I hope to see many of you there. Everything was spot-on perfect at our party. meeting rooms were everything we hoped for - and more. And this was due in large part to their manager and the amazing staff.